Urban Gladiators + Solar Sky Bar-double shot. extend the weekend with this fitness and party mash-up. Put in the sunday sweat-work, then reward yourself with sweeping views of the city sipping on fancy cocktails #balance. lol. START: Urban Gladiators, Wilhelmstraße 14, 10963 Berlin. FINISH: Solar Sky Lounge, Stresemannstraße 76, 10963 Berlin. U - BAHN: Hallesches Tor / Kochstraße or Checkpoint Charlie. THE WORKOUT: Sunday 16.15pm ‘Get Lean’ with Markus. 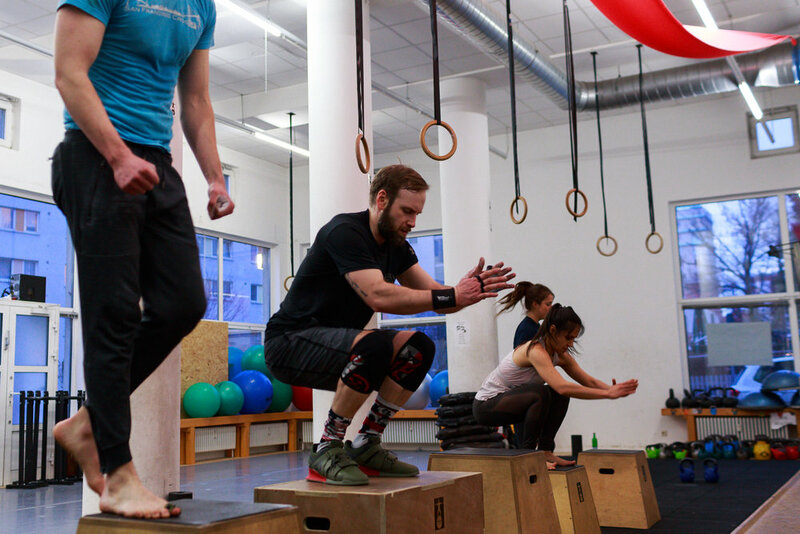 Urban Gladiators is a studio that delivers functional training across a variety of disciplines; from cross-training and strength, to Calisthenics, high intensity fitness and even yoga. Get Lean is one of their most popular, since it offers a happy medium between building strength, working on Calisthenic movements (like ring-work and bar work) alongside a solid cardio-fitness foundation. The crowd is super friendly here - even if you don’t speak German you’ll be included like a regular in the class. All the trainers are very experienced and classes are kept fairly small (around eight people) so that they can keep an eye on your form. Start with a thorough warm-up and then move through a skills- strength session where you work on building a solid core foundation that you can build on. Complete strength exercises back-to-back (think superman’s, V-sits, static ring holds and hanging bar holds) in a circuit. Repeat a certain number of times before you’ve earned your first break. The second half of class gets the heart-rate up with some higher intensity metabolic conditioning - again circuit-style for time. Work for example 45 seconds on, 15 seconds off across jump-rope, squat jumps, plank push-ups and eccentric pull-ups. We aren’t gonna lie, it’s tough but since you’re all in it together the group motivation is high. If you like what you try then talk to Benny - the founder of UG - who can help you pick the right class options for you to hit your goals. After class hit the showers to get pretty for the party. THE PARTY: Get in a glass lift and take the party 70 meters high, (to level 17 to be exact), at Solar Sky bar. Since it gets dark at 16:30pm these days, the city will be lit-up like a Christmas tree. Rest your tired legs and unwind as you sip a cocktail on one of the cosy Lounge couches. This is like drinking in one of your friends’ living room - but with awesome views, glass walls and occasional celebrities casually walking by (J-Lo and Lady Gaga have both been spotted). The bar serves up the usual cocktails and wine. But the bartenders are super creative here and if you tell them what you like they will make something special for you. We love a glass of bubbles with a fruity liqueur. Line your stomach with some bar snacks like vinegar chips with guacamole, smoked salmon and cheese with fruit, bread and honey. There’s a restaurant on the level below that serves up more delicate palate-pleasing dishes, so if you’re hungry and want to splash out then go for it. Different nights calls for different guest djs and video art and Sunday’s vibe is chill - so you might just be here all night. THE PRICE: Email info@urbangladiators.de for your first free class. After that a drop-in class its €20 or a pack of ten classes is €150. You can also purchase a monthly deal of two classes a week from €65-100 up to four classes from €80-115. Solar Sky Bar cocktails are around €15. BEST FOR: Going all-out and embracing healthy hedonistic living. Sophie Heywood 29 November 2018 Yogibar - Yoga Studio, Boxhagener Str. 31, 10245 Berlin. Sophie Heywood 15 November 2018 Ride.bln West, Lietzenburger Str. 86, 10719 Berlin.